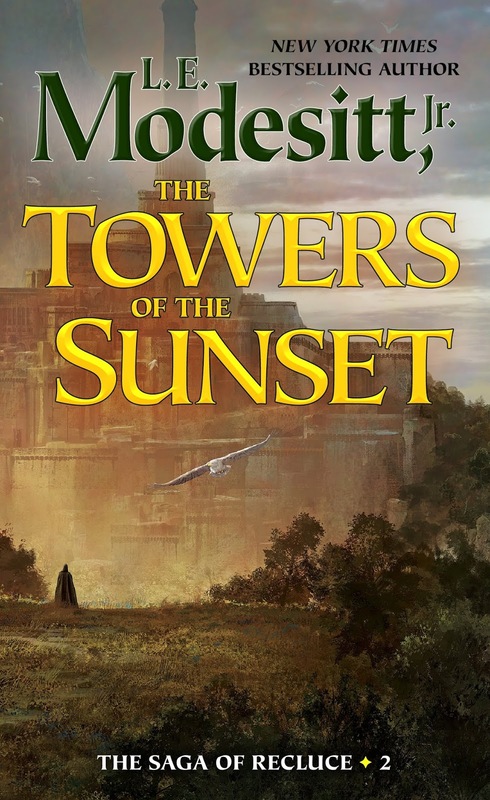 #Fantasy Review: The Towers of the Sunset by L. E. Modesitt Jr. 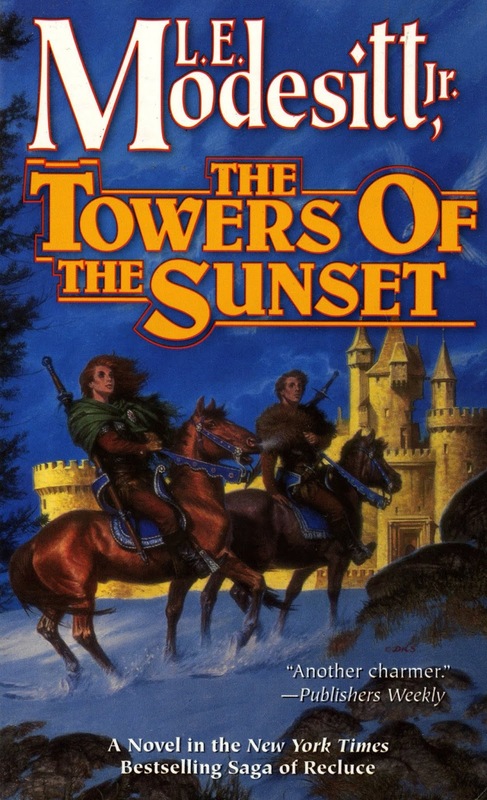 The first time I encountered The Saga of Recluce, I remember being somewhat bewildered by the progression from The Magic of Recluce to The Towers of the Sunset. Instead of picking up Lerris' story, as I would have expected of a traditional narrative, L. E. Modesitt Jr. catapults us back almost an entire millennium to tell the story of Creslin and the founding of Recluce. Unusual and unorthodox, especially with the following book, The Magic Engineer, jumping forward again to a point between the two books, but that non-linear storytelling is part of the series' charm. 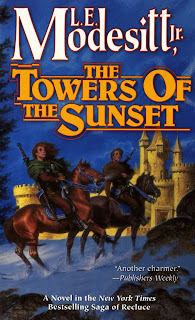 The Towers of the Sunset is part coming-of-age story and part quest tale, overlaid with a heavy dose of world-building. I'll get to the first two items in a moment, but I want to talk a bit about the world-building first. There are political, religious, and cultural elements introduced here that are absolutely fascinating. 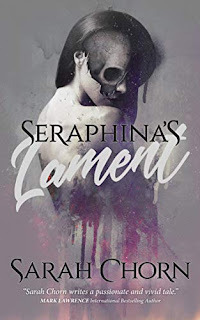 Where other authors would have settled for a typical matriarchy, Modesitt crafts a gender-flipped society where roles are reversed because of a mysterious mythology known as "The Legend" that adds a layer of intrigue to Creslin's story. 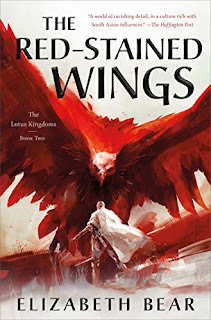 The other aspect of world-building that really excited me about this book in particular is the deeper exploration of the magic system, based not on good versus evil, but on chaos versus order. It's a fascinating system, well-defined, and based as much on science and philosophy as anything mystical. It's also the first fantasy novel I can remember that really wowed me with the use of magic. This is big-time magic, with large-scale spells that not only have impact, but consequences. The weather magic in particular is amazing, especially when Creslin has no clear concept of what he's doing or how, but it's even more interesting after the mechanics are explained. 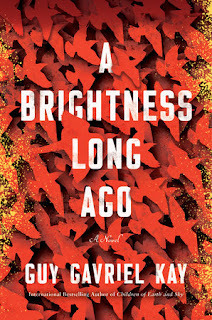 Getting back to the story, the plotting of Creslin's coming-of-age is a little thin, and it jumps around a bit more than I would have liked, but it certainly has its moments. The mountainside escape from his mother's guards is great, and his magical enslavement on the Wizard's road breathes some new excitement into the tired old trope of lost memories. It's once he and Megaera finally come together, sharing a violent, tension-filled sea voyage to Recluce, that the story really takes off, and the way they begin building a new society is far more interesting than you might expect. Along the way, Modesitt explores some complex questions of power, morality, gender politics, and family drama. Some of those concepts seem a little dated on a reread but, looking back over a quarter century, it reminds me of how daring and innovative they were for the time. 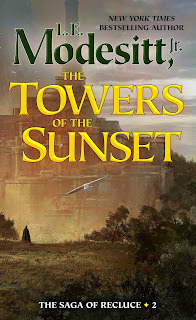 The Towers of the Sunset may seem a bit simple and straightforward, compared to the complex doorstopper epics of today, but it's an entertaining read that doesn't have a single soft spot or slow moment in the narrative. Oh, by the way, in case you're thinking that first cover looks new - it is. Tor is re-releasing the first three Saga of Recluce books this October, and they'll share a triptych by artist Marc Simonetti. Check out the stunning new artwork below.